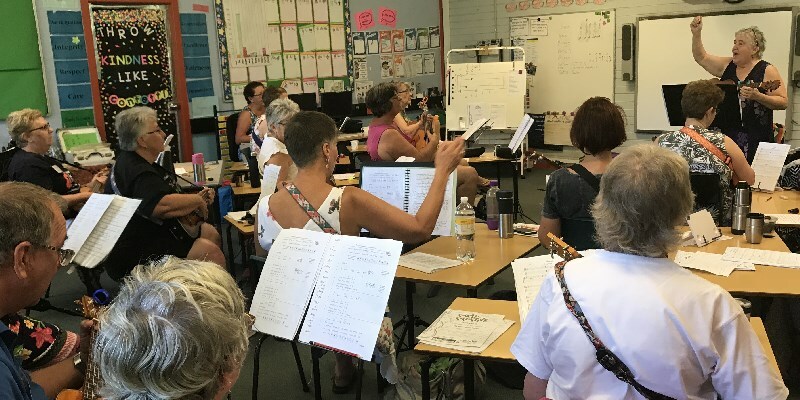 A few fortunate Brisbane ukelists took advantage of Cathy Welsford and Angie Smith’s (The Wild Women of Anywhere Beach) Strummin’ the Rhythm, Pickin’ the Tune week-long Camp Creative course on 14-18 January 2019 at Bellingen Public School. First I wish to say we had great tutors, Angie & Cathy, who encouraged us no end, throughout a very hot week. 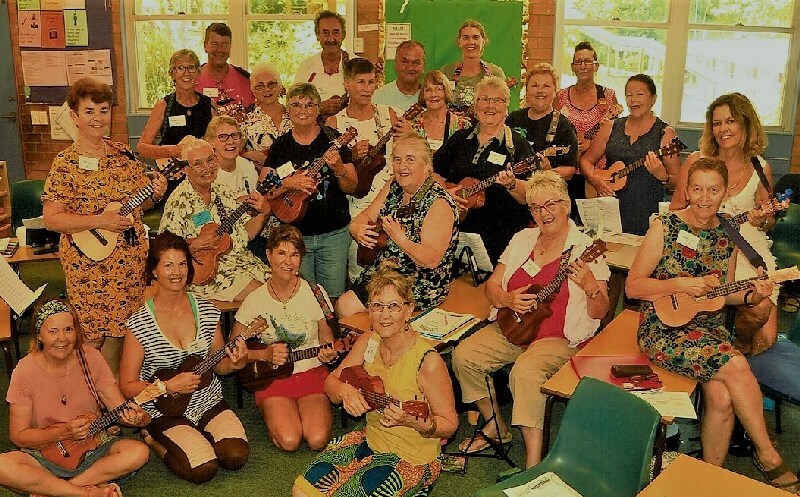 We had 22 in the Strummers & Pickers course, and split up on the first day into a strummers group and a pickers group, to about 11 in each class. The entry level was early Intermediate, so there was a variety of skills in each class. I think the pickers might have been more experienced, but we came together, for a couple of hours each day, to combine what we had learnt. Cathy taught us basic good tone technique, mainly C scale, but also Major & Minor Pentatonic & Blues Scales, progressing to other scales, using same patterns. Did some work on varied 12 bar blues, especially last day, or when we were brain-tired. Cathy also brought in some good ukulele books for technique practice, and gave us recommendation on those we might choose to buy. We did three performances, with the last one being the final concert, where a lot of groups performed, to show what we learnt in five days. 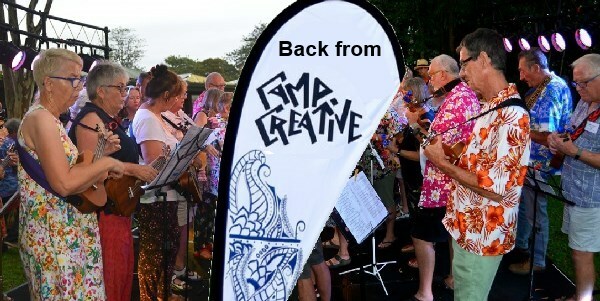 Our first was lunch time, songs being San Francisco Bay Blues, Let’s get a Cow, Camp Creative Song & Witch Doctor, mainly strumming with some finger-picking on chords. The next concert was late afternoon at a local park, so a good show-off for the town. First was orchestrated When September Ends, so pickers did either an ostinato, or the melody, with strumming and singing, over that. Then we strummed Happy Earth, followed by picking & strumming Heel & Toe Polka, while the crowd joined in by dancing. 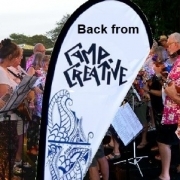 At the final concert, we did Tequila, picking & strumming, and a medley of Aussie songs. Most of the group camped at the show-grounds, so we got to know our fellow ukers, and we were ferried around to the schools by a free bus, or we could choose to walk. So heaps of opportunity for exercise, we were also next to the Bellinger River, so could swim there or at the local pool. I think there might have been about 900 campers, and another 70 or so staying close by, so Camp Creative is a big influx of culture to the town.